I was part of a Deviantart comic group that opened up a suggestion box to Ask the Mods when I noticed artists were asking for tips on how to make manga panels. Eager to help, I immediately wanted to reply with something but found it was difficult to boil down everything I felt needed to be included. Reflecting on my own learning process, I wasn’t even sure I knew what made my own panels ‘good’ or ‘good enough.’ So like everything you’ll probably read on this blog, these posts are somewhat selfish in nature, as they also serve to remind me of the important stuff that go into creating comics. If you think about what creating comic panels really are, it’s the art of arranging boxes on a page. Manga is particularly known for its diverse and bombastic arrangements. But first and foremost, nothing beats knowing the most basic of design elements: composition. Fortunately, the Temple of Seven Golden Camels (a fantastic resource blog for story board and layout artists) has two short reference links on this: Composition 101 and Composition 102. You just can’t go wrong brushing up on foundational stuff. Lilrivkah’s post regarding the pages of her OEL manga Steady Beat is quite informative as she analyzes how creating her panels informs the pacing of her story. On this note, I think it’s really important for manga/comic artists to actually “study” how the comics they read and appreciate actually work for that particular genre. For instance, the elements of a shojo manga like Fruits Basket won’t necessarily work for a seinen comic like Naoki Urasawa’s Monster. The two are very different stories and therefore, employ different kinds of pacing, layout and panels. I find that I go back and forth between more open layouts and strict grid-like formations because I want to make the panel arrangements serve the purpose of my scenes. Carson Van Osten’s helpful handout illustrates some recurring problems with staging and perspective within panels and also shows how to resolve them. I’m personally ecstatic to have come across this because even if superficially, it has nothing to do with manga, it has everything to do with depicting characters in believable environments – a most difficult task for beginning comic artists everywhere. 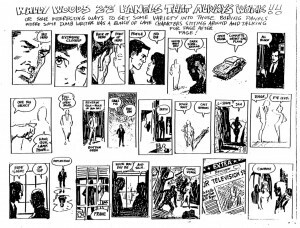 Wally Wood’s 22 Panels That Work handout (pictured above) is a nice little reminder of the different ways you can stage panels in Western comics and also helps fuel more interesting compositions. SASAKI Hisashi (former Editor in Chief of Weekly SHONEN JUMP – where Naruto, Bleach and One Piece are all serialized) recently gave some insightful feedback to young American mangaka at Comic-con last month. He also shares a lot of beginning artist problems which are worth keeping in mind. It’s no question getting feedback is an important step in growing artists’ process and whether it’s from someone as high up the ladder as Hisashi-san or your own best friend, I think you can always learn a thing or two from the people who read your work. Finally, for manga artists totally in the dark about composing their own panels, here’s a Deviantart resource group filled with Template Page Layouts. The risk of using cookie-cutter boxes is ofcourse you may not learn the right way to do things from the ground up but learning is very personal journey for everyone. What works for me may not be the same for you and I’ve always felt you still learn something just by the sheer act of DOING IT. So if you just want to make comics, go MAKE COMICS! What are some other tips, posts, and sites about comic panels you recommend? Feel free to sound off below!